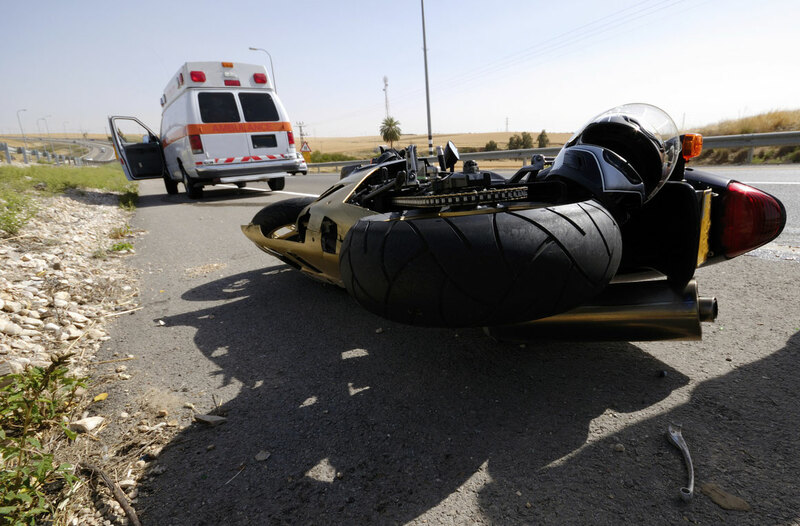 Motorcycle accidents can happen quickly but the consequences can be lifelong. A motorist was being careless and hit you and now you’re facing pain and suffering, disability, high medical bills, time missed at work, and other life-impacting setbacks. If you or a loved one have been injured in a motorcycle accident, call us at (815) 289-3209 to discuss your case with a Rockford personal injury lawyer. According to the National Highway Traffic Safety Administration (NHTSA), nearly 5,000 people die in the United States each year in motorcycle accidents. Motorcycle riders face an increased risk of injury if an accident occurs because they lack the protections of an enclosed vehicle and other safety features such as airbags, seatbelts, and other safety devices customarily found in cars. When motorcycle accidents happen, the injuries are typically serious and catastrophic in nature. Head Injuries – Trauma to the head is the leading cause of disability and fatalities in motorcycle crashes. According to studies conducted by the NHTSA, helmets are 67 percent effective in preventing brain injuries. Injuries to the head can lead to concussions, skull cracks, and even brain damage. Neck Injuries – Injuries to the neck are also common in motorcycle crashes and may paralyze or even kill a motorcyclist. Road Rash – A motorcyclist may suffer from road rash after sliding across the pavement during a motorcycle wreck. Back Injuries – Damage to the muscle, ligaments, and tendons throughout the body can occur from the impact of the crash or hitting the ground. Spinal cord injuries are also common in motorcycle crashes. Arm Injuries – When a motorcyclist is flung off their bikes, it’s a natural reaction for them to extend their arms in front to lessen the impact. Leg Injuries – Injuries to the lower extremities may result in fracturing or shattering bones in the legs, knees, ankles, and feet. At the Law Office of Adrian Murati, we handle motorcycle cases with injuries ranging from relatively minor road rash and soft tissue injuries to severe and debilitating injuries such as brain damage and paralyzation. Most motorcycle riders are like other drivers: they operate their vehicles carefully with regard of both their safety and others on the road. Unfortunately, drivers forget about all the safe motorcyclists when they see those few people who recklessly speed while weaving in and out of traffic and who pass dangerously on the right or in a no passing zone. Motorcycle are driven by irresponsible young people or lawless gang members. People see the behavior of these few dangerous drivers and falsely assume that most motorcyclists are the same. If the case goes to trial, these people may end up on the jury that will be responsible for deciding the outcome of the case. We utilize trial strategy to overcome the bias that jurors or witnesses may have against motorcyclists. At the Law Office of Adrian Murati, our Rockford personal injury firm helps motorcyclists who have been injured in motorcycle accidents through the personal injury recovery process. We will investigate the motorcycle wreck and compile the evidence, testimony, accident reports, and other documents that support your case. We will negotiate with the at-fault driver’s insurance company to try and get you a good settlement. If the insurance company refuses to settle or offers a low settlement, then starting a bodily injury lawsuit may be necessary. If you or a loved one have been injured in a motorcycle crash, call us at (815) 289-3209 to discuss your case with a motorcycle injury lawyer.